Several years ago, I took a critical look at the tools I was using for my business writing. Specifically, I asked myself why I was still using Microsoft Word as the one-size-fits-all tool for everything I wrote. In the course of that questioning, I discovered a most unlikely tool for better business writing: Scrivener ( ). Originally designed for writing fiction, Scrivener provides an integrated researching, organizing, and writing environment that makes the process of moving ideas from your brain to your screen faster and more efficient. The same features that make it ideal for writing a novel also work at the office. I now use Scrivener every day for writing proposals, contracts, and legal pleadings and briefs. Here’s how. One challenge with any big writing project is collecting and tracking research. That’s one thing that Scrivener makes easier: It includes a research binder that can hold text, PDFs, URLs, pictures, video, and most other digital media. So any time I run across a resource that will be helpful for one of my projects, I can just drag-and-drop it into Scrivener. For example, if I am writing a legal brief, I add research to the binder including my Internet research, the client’s website, images and PDF’s relating case issues, and my text notes. Later, when I’m writing, I can then jump between writing and research views—or split Scrivener’s screen so both are displayed at once. Everything happens in one app, and the usual friction you get when constantly switching between separate apps, screens, and folders is gone. In addition to collecting my research, Scrivener makes it easier to organize my writing. If you took my advice about OPML, Scrivener is a particularly good fit for that workflow. I can take the outlines and mind-maps I’ve built in other apps and import them into Scrivener. Scrivener then creates a hierarchical set of binder items matching each outline or map, making it easy to jump from the planning to the writing stage. When I start a writing project, I break my document into its component pieces, each of which becomes a binder entry in Scrivener. For example, I may have binder entries for an introduction, explanation of facts, and specific arguments. Each one of those entries may contain further subparts. I create all of these in Scrivener’s binder (or import them from an OPML file). Once created, I can make further tweaks with some of Scrivener’s organizational tools. 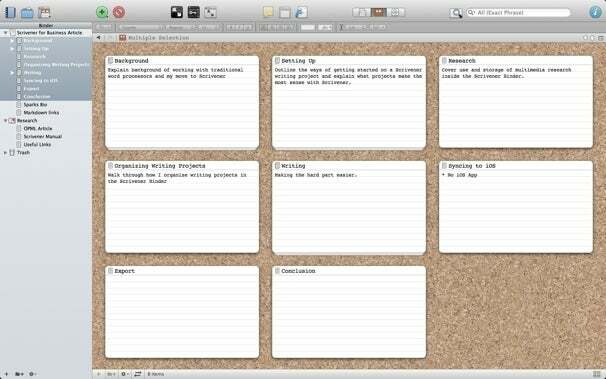 Scrivener's cork board is a great tool for organizing all kinds of documents. Scrivener additionally keeps a lot of meta-data about your document. Scrivener can track a color-coded label, progress indicator, date modified, and other bits of useful data for each document component. There are also fields for a synopsis and notes. I can use all or none of these meta-data fields, depending on the complexity of my project. All of my research and organization pays off when I start writing in Scrivener. For most projects, by the time I start writing, I’ve assembled most of my research and organized the document. If I feel myself getting stuck on one part, I can look through my Scrivener binder and find a piece of the project that I’m more in the mood to write and get back to typing. For example, when I write legal briefs I often start with some of the complex arguments that will ultimately be buried in the center of the document. Why not? I’ve already got all of my research assembled, and so I can attack the problem head on. I often use Scrivener’s full-screen mode, which hides tempting diversions like Twitter and Mail, when I’m tackling those tough parts. Once I’ve taken care of the arguments, I’ll then go back and fill in the explanation of facts. That section comes earlier in the document than the arguments, but it can make more sense to write it after I know my arguments: By then I know which specific facts are critical and deserve the most attention. Whether it’s a legal brief or a technical book, the last thing I ever write for a big project is the introduction. It is so much easier to write a good introduction after you’ve crafted your document. While there isn’t a Scrivener iOS app, Scrivener does support syncing its data with Simplenote ( ) and Dropbox ( ). When I wrote iPad at Work, I used this feature to keep the entire book’s Scrivener file synced to Dropbox. 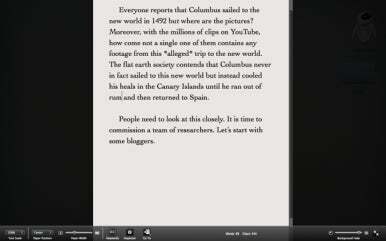 I could then access the text using a Dropbox-friendly text editor to edit and proofread from anywhere. Although Scrivener can change the way you write, it is not a traditional word processor. It doesn’t have most of the advanced layout tools found in Microsoft Word and Pages. If you need those features, Scrivener makes it easy to compile your completed document into several formats including Word, RTF, HTML, OpenOffice, Final Draft, and ePub. What makes Scrivener so useful is the way it replaces traditional word processor features with writing tools. I find writing with Scrivener liberating. Even though this tool was originally created for novelists and scriptwriters, it can work remarkably well for the rest of us, too. David Sparks is a practicing attorney, editor of the MacSparky blog, co-host of the Mac Power Users podcast, and author of Mac at Work (Wiley, 2011) and iPad at Work (Wiley, 2011).